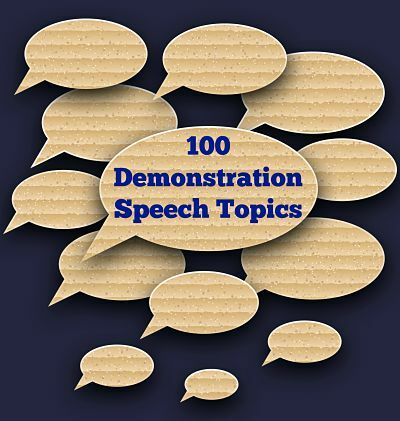 Here's a list of 100 good demonstration speech topic ideas that you can use in your demonstration speeches. These how-to speech topics cover a truly HUGE range of activities, so I hope you can find a subject that works perfectly. If not, take a look at the things you do on a daily basis. I'm sure you'll be able to come up with at least 100 more demonstration speech topic ideas of your own! If you already know how to do something on this demonstration speech topic list, then you will be way ahead, in that you won't have to learn how to do the project yourself before preparing a speech! You will need to gather all of your visual aids so that you can show your audience what you talk about step by step. Demonstrative devices include the products used in the process, posters, slide shows, and white boards. In addition to the sense of sight, take advantage of all five senses when possible including sound, touch, smell, and taste. Make sure you create a demonstration speech outline before putting together your presentation and practice in front of a test audience (friends, family, or tutors) so that you feel confident presenting your demonstration speech topic on the day. Do one of these ideas appeal, but you're not sure how to decide for yourself? Then research or brainstorm a selection that seems appealing! That way, you'll end up talking about something that interests you, AND you'll learn a new skill along the way! A well-planned talk illustrating how to create, how something works, or how to complete a task is educational and transfers valuable knowledge to the next person. A formal demonstration speech is most like tutoring from a parent or mentor. If you have ever received a lesson on something new, it probably began with an informal demonstration speech.